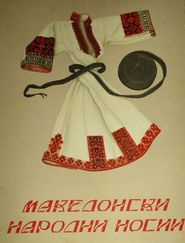 Beautiful, comprehensive reference to Macedonian traditional folk costume. An excellent resource for the collector -- very good for costume identification. A fine addition to any ethnic library. The beautiful plates are also suitable for framing or display. 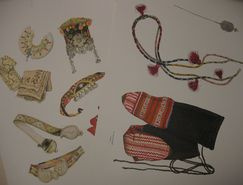 The complete Macedonian costume is shown, followed by several plates with the costume elements spread out, plus pages of construction designs and patterns. Text in Macedonian, French, and English provides complete details. In many costume reference books, costume elements are often obscured by top layers of clothing, so certain accessories are not visible. 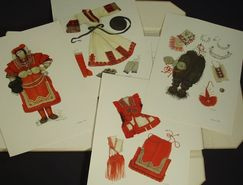 The Macedonian portfolio illustrations show all the elements and accessories of every costume, in separate detail, named and described. More Crna Gora costume detail On the right is a kyustek, a bead crochet hair ornament with tassels; the same technique used to make the beaded bracelets and beaded snakes that many of us love.